St.Martin-des-Fountaines is one of the smallest communes in the vendee, its is 2 kilometers from L'Hermenault in the south of the Vendee. The name comes from the fact that there are 14 springs (fountaines) that rise up from artesian wells which has allowed the village to be be reasonably prosperous from both agriculture and ancillary trades like milling and tile production. The factory in the village which has produced the tradition Vendeen tiles for several centuries, also produces the redgra surface for the famous Roland Garros tennis club in Paris. 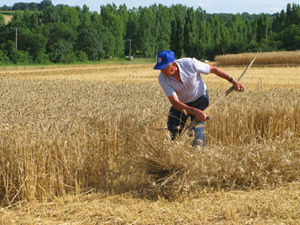 Moulin Garreau. This beautifully restored water mill is let as gite accommodation during the season and occasionally open to the public on Patromoine days in mid September. Vide Greniers. 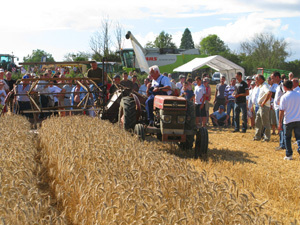 Normally held the second Sunday in September (2011 11th Sept.) it is one of the largest in the south of the Vendee. Village Fete. Though not usually an annual event when they do occur they are generally excellent. The fete of August 1st 2010 was no exception. 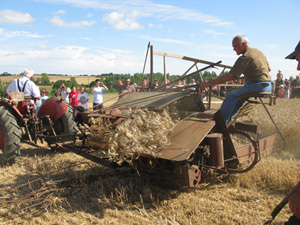 The theme of "Terre and Ble" was about old time farming methods and included ploughing with oxen, steam tractors and old tractors, the harvesting of wheat by hand, using animal power and antique machines.